ICICI direct, a full-service online trading and investment platform is owned by ICICI securities. We bring for you ICICI Direct Review, brokerage charges, features and other useful analysis. 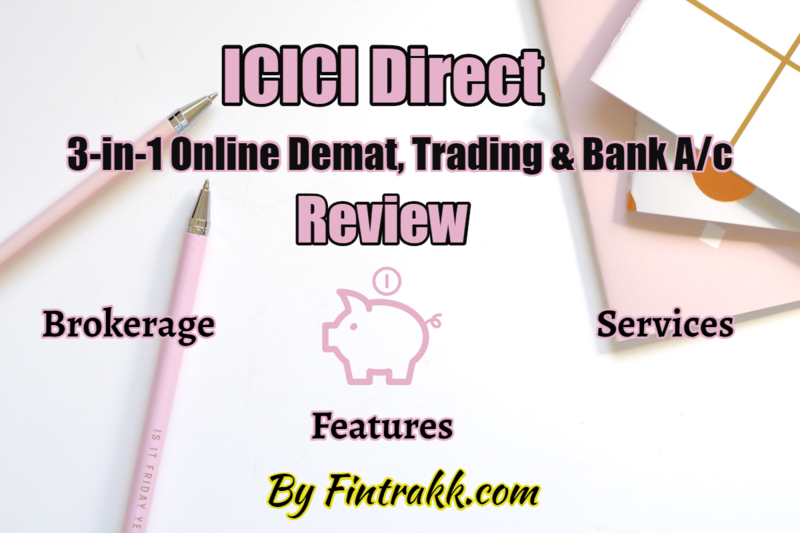 In short, you shall become familiar to all the important details about ICICI Direct Demat and Trading account in India. ICICI securities started as a retail stock broker. It is one of the largest stock broker in India with a wide user base. Moreover, it has 200+ branches across India. This includes an ICICI saving account, a Demat account and an ICICI direct account to manage various investments. A 3 in 1 account helps all your investments at one place. So, you can manage everything efficiently. With ICICI you can invest in stocks, mutual funds, select insurance products, fixed deposits etc. So, it provides you a unified dashboard for investments. ICICI direct provides a web based share trading account. You can use it for buying and selling of stocks on BSE or NSE. With your ICICI direct trading account you can do cash trading, margin trading, spot trading, margin plus trades. In addition to it, you can invest in IPOs as well as mutual funds. ICICI direct offers two kinds of brokerage plans to its customers. One is a flat brokerage plan which is called I-Secure plan. Other is a variable brokerage plan called I-Saver plan. I-Secure plan is a flat brokerage plan. This means trader gets charged a fixed percent of his trade value irrespective of how much he trades. I-saver plan is a variable brokerage plan. This plan offers brokerage based on your trading volume. In fact, your brokerage cost reduces as your trading volume increases. So, if you are a high volume trader I-saver plan can help you reduce brokerage costs on your trades. Currency options: Flat Rs 10 to 25 per lot, Brokerage on the second leg of Intraday square off Rs 10. Integrated account: First and foremost, ICICI direct offers a 3 in one account. This means, you have an integrated savings account, a trading and a Demat account. This results in a seamless experience and easy money movement. You do not need to transfer money in and out of your Demat account. You can invest in Mutual funds, IPOs, NPS , post office schemes. Not only this, you can even put money in select insurance schemes from ICICI Lombard. Hence, you get one unified view of your investments. You can trade on both BSE and NSE through ICICI direct. You can enjoy a good support service, as described by their customers. High brokerage charges: With the advent of discount brokers in India, the high brokerage charges of ICICI direct has started pinching. Although you get to diversify your funds. But, commodity trading is not available. The 3 in 1 system also introduces a lock in into ICICI system. You have to compulsorily open up an ICICI savings account. Rs 35 per trade might seem to be high for a trader who does small trades. Trade racer the trading terminal is charged extra Rs 75 per month, if your brokerage is less than a threshold of 750. This adds to the total cost. They only offer regular mutual funds schemes and do not offer direct mutual fund schemes. You can put GTC (good till cancelled) orders not available with many brokers in India. You need to maintain minimum balance in your connected savings account. How to Invest in Stocks from ICICI Direct? Simply, Login to ICICI direct using your username and password. Click on Equity on trade and invest page. Click on allocate funds to allocate funds for trading. Go to place order option on the left-hand panel. Select cash buy or Flexi cash. Then select NSE or BSE. Enter the quantity you want to buy. Verify your order, click on proceed. How to invest in Mutual funds using ICICI Direct? Login to ICICI direct using your username and password. Click on Mutual fund tab on left panel. Then, click on purchase under-invest now. Select the fund that you want to invest in by typing the name of the fund. Choose SIP or Lumpsum method of investing. Use Fund categories to shortlist the right fund. Click on continue to invest. Further, add the investment amount. Pay through allocated fund/net banking for lump sum investments. How to open an account in ICICI direct? You can visit nearest ICICI direct centre or ICICI bank branch to open up your ICICI direct account. ICICI direct account opening is done in most branches of ICICI bank. You may request for a 3 in 1 ICICI direct account. If you have an existing ICICI bank account you can convert it into a 3 in 1 account. From the top navigation bar click on open an account section. Fill in the registration form. Select the account option you are looking to open and click submit. You shall get a system generated ARN number. Keep it handy since you’ll need to put it on the physical form. An ICICI direct executive will visit you within 2 days to get documents, your signatures and other account opening formalities. You would need following documents for ICICI direct 3 in 1 account opening (2 photographs, valid address proof, valid identity proof). One photograph for the nominee. Xerox self-attested copy of address proof (Passport, Aadhar card, driving license, lease agreement etc). None of these charges are negotiable. ICICI direct is a reputed and safe trading platform. In addition to it, with ICICI bank account integration, it has become a user friendly experience. Moreover, it provides multiple investment options like mutual funds, FDs, NPS. Hence, this helps you build a personalized investment dashboard. One aspect where ICICI direct lags, is providing advanced analytics and insights for trading. A lot of improvement can be done in this area. Also, cost wise ICICI direct seems to be one of the costliest platforms, It is hard to justify the extra cost you pay for the value you get out of the platform. 1. Are the brokerage rates negotiable for ICICI direct? No, the brokerage rates are non-negotiable for ICICI direct. You have to pay the list price. 2. Can I use ICICI direct with another bank account? No, you will have to open up a savings account with ICICI. 3. Is the savings account a zero balance account? It is advertised as a zero balance account. But, you must check with your relationship manager. 4. Can I trade in commodities with ICICI direct account? No, you cannot trade in commodities with ICICI direct account. 5. What all insurance products I can buy through my ICICI direct account? You can buy selective insurance products offered by ICICI Lombard insurance through this account. 6. Are full-service accounts better than discount brokerages? You get better services with full-service account. But, you need to see if the extra cost is commensurate to the value. This is all about ICICI Direct, brokerage charges including other minute details. This data is given on “as is” basis. The charges and conditions may vary at a later date. Kindly check with the respective stock broker before investing your money. Disclaimer: There is a high degree of risk involved in stock trading. Mutual funds are also subject to market risk. The details given on this website is for informational purpose only. It should not be constituted as professional advice in any regard. How did you find our ICICI Direct review? Where have you opened your Demat & trading account? Which one do you prefer: a full service or a discount broker as such? Feel free to share your feedback.